Automation is taking over the world. Although much of that during the past decade has been through software, engineers have been hard at work on hardware robots that will eventually replace humans. Among a new generation of robots is the HRP-5P. This sleek-looking futuristic machine is the product of over half a decade of research at Japan’s National Institute of Advanced Industrial Science and Technology (AIST), and it does a whole lot more than just stand around and talk with bizarre facial expressions. The HRP-5P is a construction robot. That means that it has been built specifically to construct things, such as building a new shed for you to store the boat you never use or repair a wall you punched after the Eagles lost last weekend. It’s impressive to watch in motion as it picks up 55lb sheets of plywood and then screws them in-place with the kind of accuracy you would only expect from Tim the Toolman Taylor. 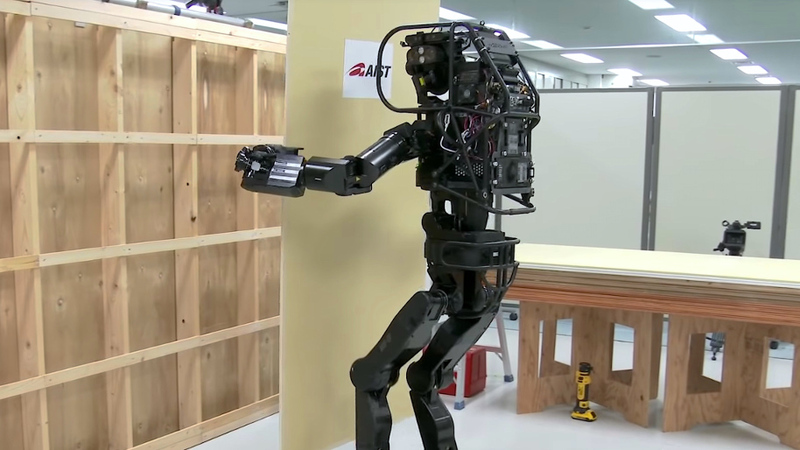 The HRP-5P stands 5’9″ tall like Tommy Wiseau and weighs just over 222 pounds thanks to its steel-based frame. Capable of spinning its hand like The Exorcist head spin and balancing itself like an Olympian gymnast, all without having to be directly connected to a computer like most robots, it’s one of the most promising robots we’ve ever seen. Yet, as great as it looks in the video above, if there’s one thing we’ve learned the past few years it’s that robots aren’t quite production ready (see exhibit a and exhibit b). But with a little more polish, it shouldn’t be long before we start putting millions more working class people on unemployment.